WILMINGTON, Del.--(BUSINESS WIRE)--Chase Card Services, the leading co-brand credit card issuer in the U.S., and United Airlines today launched a no annual fee credit card to reward leisure travelers. The UnitedSM TravelBank Card allows customers to earn 2% on United® purchases and 1.5% on all other purchases in TravelBank cash – and to redeem it toward United flights. The United TravelBank Card is similar to cash-back cards as customers earn TravelBank cash, which can then be used toward the cost of a United flight. 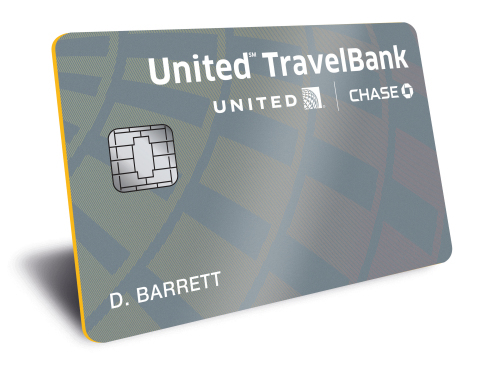 The card also offers a broad list of additional benefits not widely found in traditional cash-back cards, including no foreign transaction fees, trip cancellation/interruption insurance, auto rental coverage and 25% back as a statement credit on food and beverage purchases onboard United-operated flights. Customers will also have access to exclusive experiences through Inside Access from Chase, voted “Best Credit Card Special Events” platform by Global Traveler. Even if customers have not earned enough TravelBank cash for the entire price of a United ticket, they can see an immediate benefit. For example, if they have earned $75 in TravelBank cash, they can use that toward a $200 flight and pay the remaining $125 with their United TravelBank Card. TravelBank cash is seamlessly integrated in the checkout process on united.com, allowing customers to redeem for as little as $1. Upon approval, customers will be eligible to earn $150 in TravelBank cash after spending $1,000 in the first three months the account is open. The United TravelBank Card joins a rich credit card program that also includes the United MileagePlus® Explorer, United MileagePlus® Explorer Business and United MileagePlus® Club Cards. New United TravelBank Cards will be exclusively Visa cards. For more information about the United TravelBank and MileagePlus Cards, visit UnitedTravelBankCard.com. Chase is the U.S. consumer and commercial banking business of JPMorgan Chase & Co. (NYSE: JPM), a leading global financial services firm with assets of $2.5 trillion and operations worldwide. Chase serves nearly half of America’s households with a broad range of financial services, including personal banking, credit cards, mortgages, auto financing, investment advice, small business loans and payment processing. Customers can choose how and where they want to bank: 5,200 branches, 16,000 ATMs, mobile, online and by phone. For more information, go to Chase.com.